There is tremendous increase in population, due to this there is increase in number of vehicles. The rise in number of vehicles had led to many problems like traffic congestion, increase in consumption of fuels, rising travel costs. Considering all these problems we have studied different papers. This paper introduces bike sharing application which will help people to travel on one bike and share their expenses and also reduce pollution. Travelling from one place to another has become the main issue of the society now-a-days. Increased population has given rise to increased number of vehicles for travelling purposes. Due to this, carbon emissions are being released in large amount which is harming the environment. And also because of increasing number of personal vehicles mostly cars, the parking problems are increasing and also pollution is rapidly growing. People are also suffering from high travelling costs and also fuel prices are rising. In order to overcome these problems, this paper is useful for finding different solutions on it. Bike pooling is an android application in which people will share bikes to travel distances which goes along the same route of the bike user. Bike Pooling is a pick-up and drop-off service provided to the users according to their needs. Hence number of vehicles will be reduced so that traffic congestion problems, air pollution will be reduced. Bike pooling also helps people to share their travel expenses that is fuel costs which will also be useful to save fuel for future use as fuels are getting decreased day by day due to large amount of consumption. In this application Aadhar card link will be added for getting user's true identity. It also includes Google maps for tracing real time navigation. This application is useful for booking bikes from home also. According to Aditya N. Bharadwaj the system is implemented using Internet of Things (IOT). This paper is the solution for problems like traffic congestion and pollution in Smart Cities. This paper is using RIFD module for unlocking bike and Aadhar Card for registration purpose . According to Amey S. Dodal the system is implemented using Android. In this paper the application is used to share and rent bikes. This paper provides the facility for women safety and also it includes the solution for accident problem . According to Sumit Sardar the system is implemented using Android. This paper is used mainly for Students and Employees for daily transportation. In this paper the application is implemented using integrated Google maps . According to Divyesh Patel the system is implemented using Android. In this paper the application is useful for densely populated area and the area where there is no convenient mode of transportation. In this paper the application uses real time calling and messaging features . According to Arpita Dixit the system is implemented for cars using Android. In this paper the application helps people for sharing expenses and making connections. In this paper the application provides security also . According to Sneha Menon the system is implemented using genetic algorithmic web application. In this paper the system helps users to find optimized journey. This paper is beneficial as it is low cost system which helps in travelling for people from one place to another . According to Nayana M. Nale the application is implemented for carpooling using android application. In this paper car sharing is introduced in which more than one person can share one vehicle for travelling. This paper also provides more security. Also GPS navigation is used to trace out driver's route . According to Kapil Kamble the application is based on android domain in which sharing of cars is done for travelling purpose. In this paper it provides security of travelling in car, more than one person can travel and by sharing vehicle also fuel expenses are shared. Parking problems are solved in this paper . According to Yuvraj Nalawade the system is based on car sharing so that people can share car to travel for going to the same destination. It is an eco-friendly application which consumes less fuel by sharing cars so that number of vehicles is reduced and due to that pollution is kept under control . According to Fu-Shiung Hsieh the system is based on web application. This paper helps to reduce problems like air pollution and traffic congestion as the number of vehicles is reduced due to carpooling application. Fuel costs are shared between the passengers . According to Mohammad Shahriar Rahman this paper is a web application. It is implemented using Internet Of things (IOTs). In this paper sharing of bikes is done for travelling various distances for different purposes. This paper includes solution on issues like parking spaces, traffic congestion and air pollution . According to Avila Antao the system is used for public transportation and it is eco-friendly. In this paper pick up and drop service is provided for people travelling along same distances. It provides security. This paper also reduces traffic related issues and pollution problems . The system in Figure 1 is implemented for Bike Pooling using Android Application. Bike pooling means sharing of bikes among people for travelling purpose. By sharing travel and fuel costs are reduced and also carbon emissions are decreased due to less number of vehicles and hence pollution is kept under control (Table 1). Table 1. Different types of technique used with descriptions. Bike pooling is an android application which helps in reducing traffic congestion and pollution problem. This application is user friendly and also helpful for maintaining the green environment. The application is used for traveling purpose. Guardian can get real time location of user if accident takes place. This application also provides facility of giving notification when request is cancelled. It gives us great pleasure in presenting the project paper on “Bike Pooling Using Android Application”. We take this opportunity to thank all persons who rendered their full services for us. It’s with lot of happiness we are expressing gratitude to our guide Prof. Pranali Mahadik and H.O.D Prof. Manoj Mulik, Computer Engineering Department, for timely and kind help, guidance and providing us with most essential material required. We are very thankful to our guide for their indomitable guidance. Their inspiration up to the last moment hand things possible in a planned manner. We also thank Prof. Rama Gaikwad, Project Coordinator, Computer Engineering for the cooperation extended for the project .Finally we thank each and every one who helped us in our project work with their support, kind help and guidance. Bharadwaj AN, et al. Public Bicycle-Sharing System. National Conference on Product Design. 2016;1-4. Dodal AS, et al. Bike Sharing and Rental System: An Android Application. International Journal for Research in Applied Science and Engineering Technology. 2016;1123-1127. Sumit S, et al. SPAC DRIVE. : Bike Sharing System for Improving Transportation Efficiency Using Euclidian Algorithm. International Journal of Advance Engineering and Research Development. 2017;3:127-130. Divyesh P, et al. A Smart Real Time Ridesharing Android Application. International Journal on Recent and Innovation Trends in Computing and Communication 2016;4:188-192. Arpita D. Real-Time Carpooling System for Android Platform. International Journal of Engineering and Innovative Technology (IJEIT). 2012:436-437. Sneha M, et al. Take Me with You: A Smart Carpooling App Using Genetic Algorithm. International Engineering Research Journal (IERJ). 2016;2:962-964. Nale NM, et al. Real-Time Carpooling Application for Android Platform. International Journal of Engineering and Computer Science. 2016;5:15900-15903. Kapil K, et al. Car Pooling Android Application. International Journal of Engineering Research in Computer Science and Engineering (IJERCSE). 2016;3:29-32. 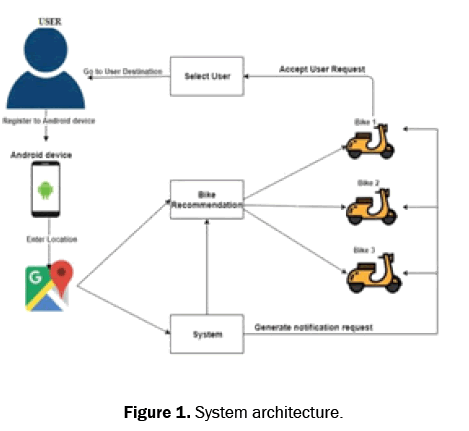 YuvrajNalawade, Implementation of Dynamic Carpooling System on Android Platform”, International Journal of Innovative Research in Advanced Engineering (IJIRAE). 2015;2:247-249. Hsieh FS. Car Pooling based on Trajectories of Drivers and Requirements of Passengers. IEEE International Conference on Advanced Information Networking and Applications. 2017;972-978. Rahman MS. Secure Bike Sharing System for Multi-modal Journey. IEEE International Conferences on Big Data and Cloud Computing. 2016;437-444. Antao A, et al. Carpooling Application inAndroid. International Journal of Current Engineering and Technology. 2015;955-958.